Blipp Name - this will appear in the dashboard and search results. Add background audio - Within the ‘Add audio file’ window users, can upload an mp3 or choose from their library. This sound will play at the blipp’s opening scene. 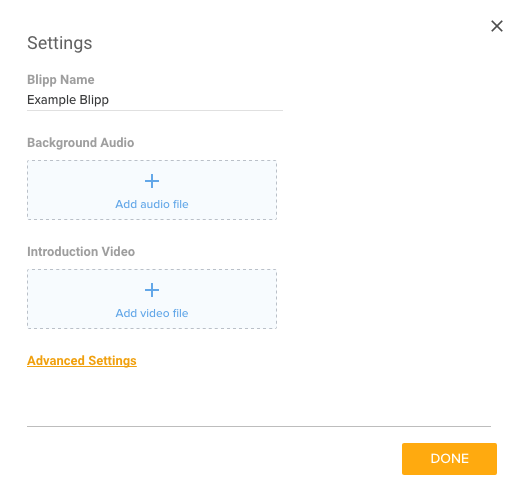 Add an intro video - Within the ‘Add video file’ window, users can upload a new video file or choose from their library. This will cause for a full-screen video to play upon blipping. Advanced Settings - Allows you to have more control over your blipp. Share Screenshots - This controls if the user can share a screen shot on social media. Add blipp to favorites -This controls if the user can view the blipp again without a marker. 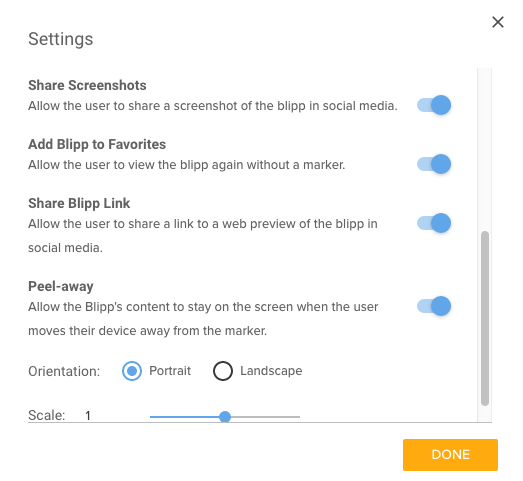 Share blipp link - This controls if the user can share a link to a web preview of the blipp in social media. Peel-away - Allows the Blipp's content to stay on the screen when the user moves the device away from the marker. You can also select portrait or landscape orientation and scale for the peel-away. Where do I find the settings feature? Click on the arrow in the top left corner next to the blipp name. A pop-up window will appear in the center of the canvas with the setting features listed above. If you have any questions on settings, share them in the comments below. I need to keep the filenames of my pages, blippar changes the names the filenames when uploading!!!! Verry irritating!! !